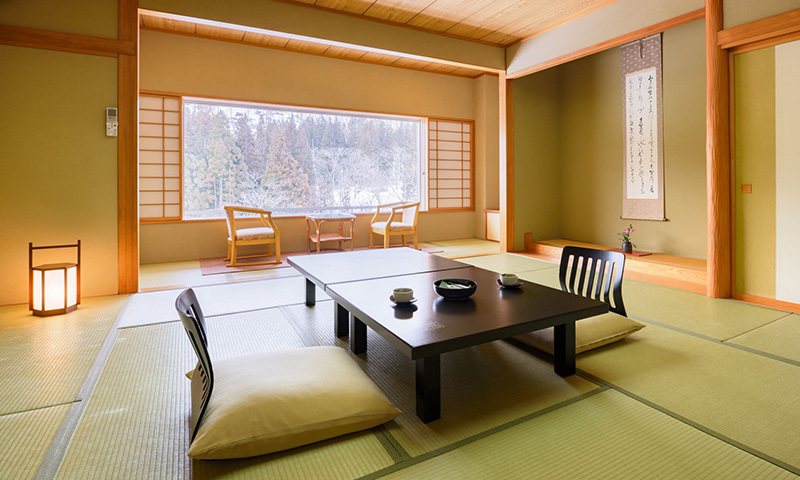 Ginzanso is a traditional Ryokan (Japanese Inn) that is located about 5 minutes away from Ginzan onsen. Providing its customers with a relaxing luxury experience, through the hot bath spa and delicious Japanese cuisine, the hotel has been recognized for its excellent service by the Japan National Tourism board. Note: The prices listed above are approximate. It may change according to the season and it will gets cheaper if there are more than 2 people. We have two types of rooms for our customers. There are standard rooms with normal facilities and deluxe rooms that have an additional attached hot bath facility. The guest rooms are purely Japanese-style that builds a calm atmosphere for the guests. The guests can enjoy the scenery and bird watching as each of the rooms face the river-side and the mountains. At night, the river-side is lit up so that the guests can enjoy the view and relax. Additionally, please enjoy looking at the paper shade lamp with an art made by the famous Japanese artist Kenji Uchino while walking through the building. Japanese style room with private half-outdoor bath. Looking at the mountains and rivers from the window of the room and private bath makes your heart relax. 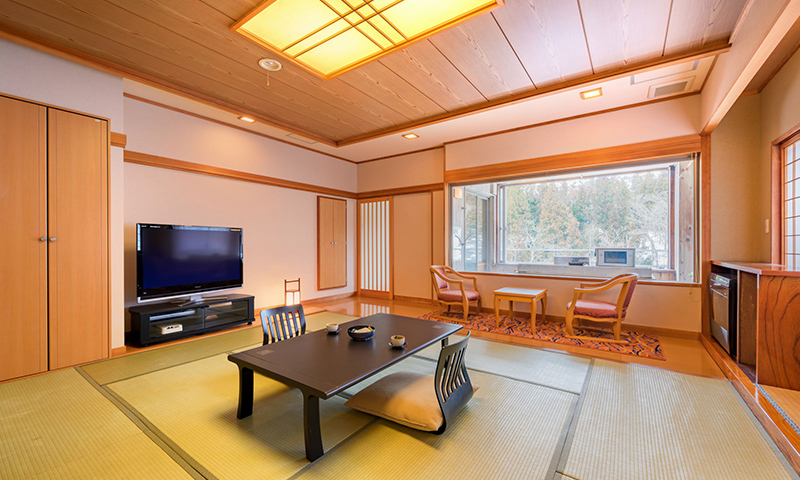 Standard Japanese style room. Room size is 10 tatami mats or more. The guests can enjoy the scenery and bird watching as each of the rooms face the river-side and the mountains. At night, the river-side is lit up so that the guests can enjoy the view and relax. We offer a Japanese style dinner to the guests. The main dish is the special Wagyu beef steak of the Yamagata prefecture that is roasted on a tabletop stove. We use local ingredients to cook traditional recipes. The food is changed every season. We recommend you to try the local drinks or local wine or sake during dinner. Japanese style dinner. The main dish is the special Wagyu beef steak of the Yamagata prefecture that is roasted on a tabletop stove. 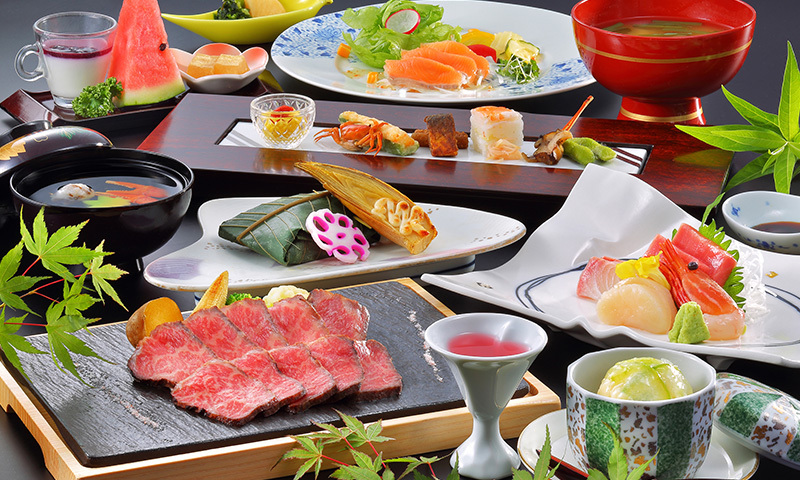 Wagyu beef steak, Tuna sashimi, Yamagata Prefecture brand rice Haenuki, and more. The food is changed every season. Japanese style dinner. The amount of Wagyu Beef steak is doubled compared with the standard course. This course is popular. 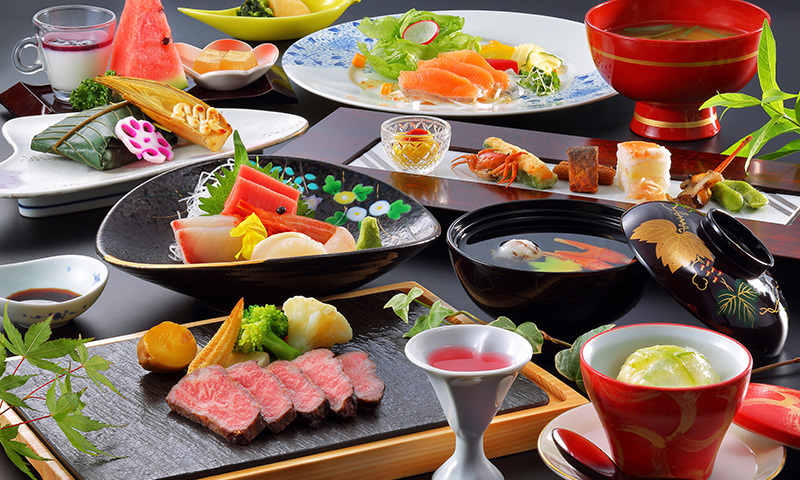 Double wagyu beef steak, Tuna sashimi, Yamagata Prefecture brand rice Haenuki, and more. The food is changed every season. Japanese style dinner. The main dish is Seafood casserole and Seafood steak on a tabletop stove. For people who can not eat meat. 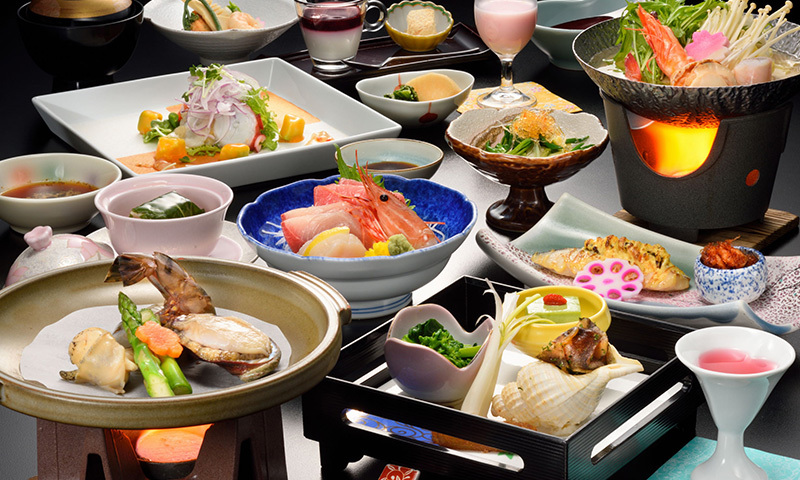 Seafood steak, Seafood casserole, Tuna sashimi, Yamagata Prefecture brand rice Haenuki, and more. The food is changed every season. 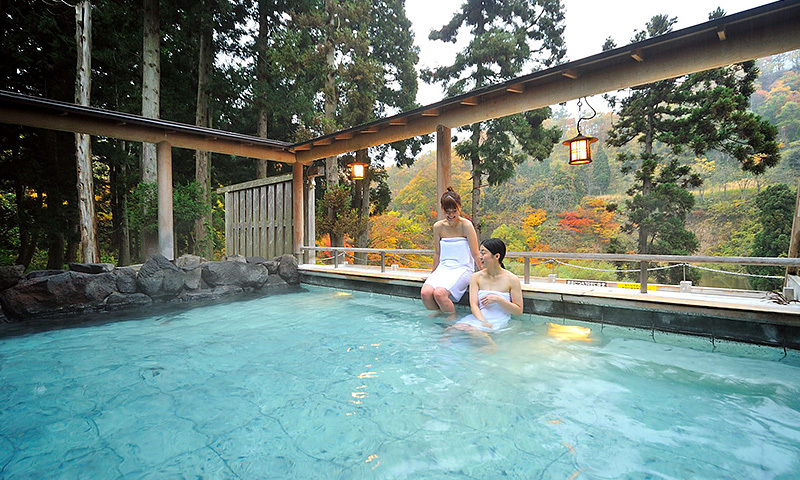 Ginzanso offers a luxury experience to its customers through its relaxing outdoor hot spring. In spring, you can enjoy looking at the greenery of the mountains. In autumn, it turns orange with the changing color of the leaves. In winter, everything turns white and beautiful with the snow. You can dip your body and relax in the bath while you enjoy the view in every season. There are two indoor public baths at Ginzanso. One is men's bath and Other is women's bath. The indoor public bathhouse leads to an outdoor bath. 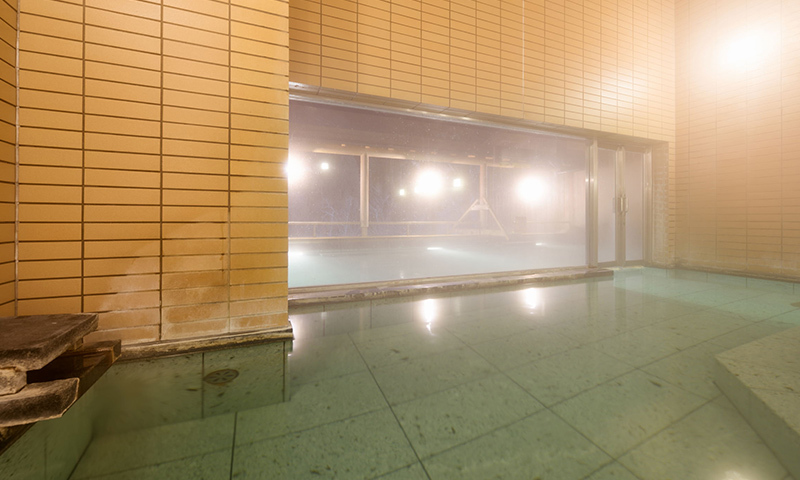 The indoor public bath is a hot spring, and the hot water is the warmest. There are two outdoor public baths at Ginzanso. The outdoor public bath leads to an indoor bath and outdoor lying bath. The outdoor public bath is a hot spring. Good view. 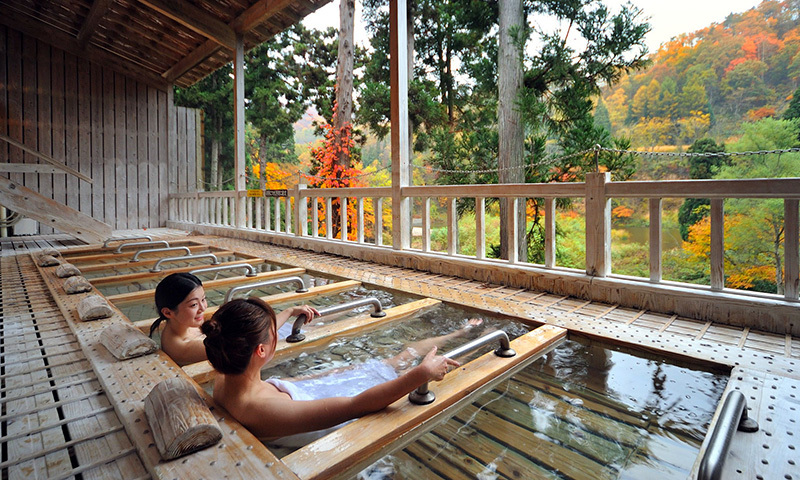 There are outdoor public lying baths at Ginzanso. The outdoor lying bath leads to outdoor public bath. The outdoor public bath is a hot spring. Good view. We have bed-rock bath facility that provides a relaxing experience to our customers along with numerous health benefits. Upon reservation, we also have foot massage facilities. We have dining spaces enough to conduct seminars and parties.? We have a souvenir shop in the lobby of the hotel where the customers can buy different kinds of Japanese handicrafts and snacks.